Cleaner for Awnings, Tents and recommended to clean your TreePod Cabana or Lounger – Fenwick’s Canvas Cleaner. 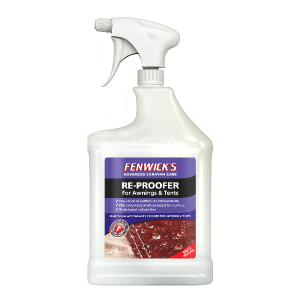 Ideal preparation for use with Fenwick’s Reproofer. Fenwick’s Cleaner for Awnings & Tents will easily remove black streaks, green algae and grime from your TreePod. It also assists in removing road traffic film, diesel fumes, and over wintering grime, from tents and awnings. Fenwick’s Cleaner is suitable for cleaning synthetic and colour fast canvas fabrics. Apply to surfaces from bottom to top. Allow one – two mins to soak in to the canvas. But do not allow to dry. Agitate with a microfibre cloth, sponge or soft bristle brush. Rinse thoroughly with clean cold water. Start at the top and work your way to the bottom removing all traces of cleaner residue. Allow the canvas to dry. On porous fabrics apply such as the TreePod canvas, we strongly recommend Fenwick’s Reproofer for Awnings & Tents to waterproof the fabric once again. Packaging may differ from that shown currently. We recommend you try the cleaner on a small area first and follow the instructions on the bottle.